I have a confession… I love Lush! You might not think it, but Lush have a whole variety of products that are perfect for use with your beard! Even some of the products not designed for beard use. Starting with the products that are actually meant for beard use. This was also the first product I ever used. My favourite thing about it? It’s quick, easy and I can use it in the shower for speedy use. It’s also great to be used on the rest of your face, for added cleanliness. It’ll leave you face and beard lovely, soft and fresh. It’ll also last ages! Like everything in Lush… Sometimes I feel like a bad customer for not needing to go in very often. Anyways, just use a tiny amount, you don’t need loads for each wash. Top tip: Use a small amount on a dry beard to style and add a touch of fragrance for the day, brilliant less harsh alternative to beard waxes and gels. Great for double use, can be used for the hair on your head as well as your face! This is great for those of you with beards that might feel a little brittle or even a bit sharp (eek! ), particularly if it’s quite short. It’s a moisturiser so expect your beard to feel lovely and soft, with a lovely uplifting scent! This one isn’t made for beards, but it’s always fun to get creative. Another one where less is more, especially given this one is really intended to be used on long hair rather than beards. Best used on a wet beard after towel drying to let the goodness sink in. Okay, first off this stuff smells AMAZING! Like actual custard. But don’t eat it. No tea, no shade, but it tastes terrible (compared to the scent). In defense of Lush, it wasn’t made for eating. This one was given to me as a gift from a Lush buddy (go and befriend people that work at Lush!! 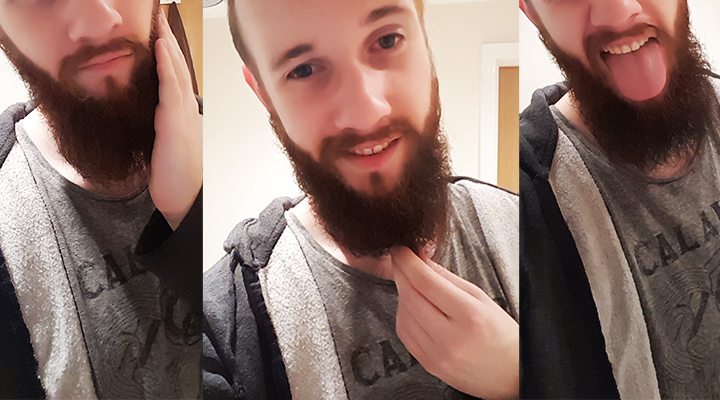 ), so I thought I’d give it a go in my beard. Then I discovered I could smell it all day if I really concentrated. I’m sold. Again, made to be used in your hair, so it’ll make your hair feel lovely too. It’s great to use on a wet beard, it’ll make it a little more malleable for styling once dry. Don’t be put off using it on a dry beard though, just be aware that you’ll really need to rub it in otherwise it’ll show up quite clearly. 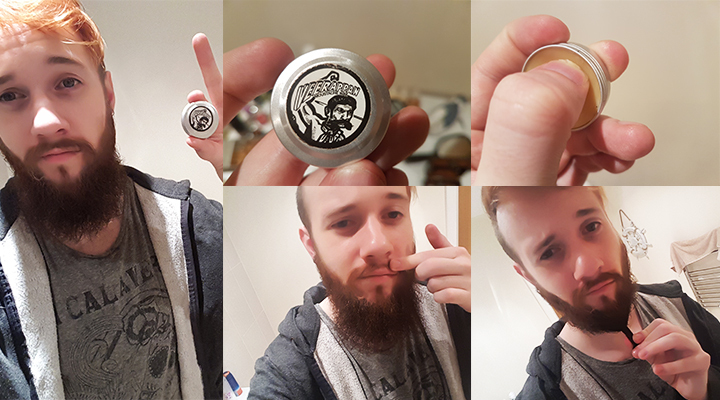 It might make your beard feel a bit odd, sticky even, but it’ll definitely add thickness and has pretty good hold for keeping your style! Keep a brush handy for this one, you’ll want to brush it through (a regular hair brush will do, s’what I use!). Who said you had to be satisfied with the colour of your beard as it is? With Lush Henna dyes you can spice up your life, and your beard, with a touch of red. A perfect Autumnal look to add a touch of colour, given how grey the skies are getting right now. There are a range of Lush Henna dyes to choose from. If you’ve got quite a light coloured beard naturally, you could go full on red with the lightest shade. Or, you could go the opposite way with the darkest shade, for a dark, mysterious look. The choice is yours! The last styling step is Lush’s very own moutsache wax! It’s easy to use and it’ll give you a strong hold that lasts all day. Best way to use it is to scrape it out with the top of your nail (otherwise you’ll find loads of it gets stuck under your nail), just a tiny amount will do. Rub it in to your fingertips and then style as you like. I like to pretty much glue my moustache down, helps keep it out of my mouth. But you can always curl it up, or let your imagination run wild! I also use this stuff in my beard to try to keep it tamed – I like to rub it in the twist my beard around, then let it go. Helps keep it all together. That’s really hard to describe so check the picture above to see what I mean. This is another great hair dressing, like Hair Custard, but sans eggs. I tried this one when I toyed with going vegan. Rest assured, everything in Lush is ethically sourced, but if you do want to avoid eggs this is a great alternative! It’s also a little bit lighter than the Hair Custard, both in consistency and colour – so it’ll add less weight but if you have a darker beard you’ll probably want to use a little less. You’ll get a whole different scent from the hair custard – lime for a burst of freshness and banana for touch of mellowness. Great for any mood! “But wait, eyebrows aren’t beards!” Unless you think of your moustache as the eyebrow of the mouth? Didn’t see that curve ball coming, did you? I read this tip a long time ago that if you want a thicker looking moustache, an eyebrow pencil can help. The trouble is most eyebrow pencils are fragile and wooden like…well, a pencil. So when they start to wear down it can get a bit frustrating, and painful (wood can get sharp and splintery). Say no more to that little problem, Lush eyebrow pencils are more like a child’s crayon, and I couldn’t be happier. There are also a few shades for you to choose from. So you can either match your colour for a slightly thicker look, or go for a darker shade to take it all the way. I prefer a darker shade – for some reason my moustache is much lighter than the rest of my beard, so I prefer it to match. Heck, you can even use it on your eyebrows if you like! Top tip: if you use the red shade, your skin might redden around your beard so try a colour supplement – I use Jackie Oats because I’m super pale. 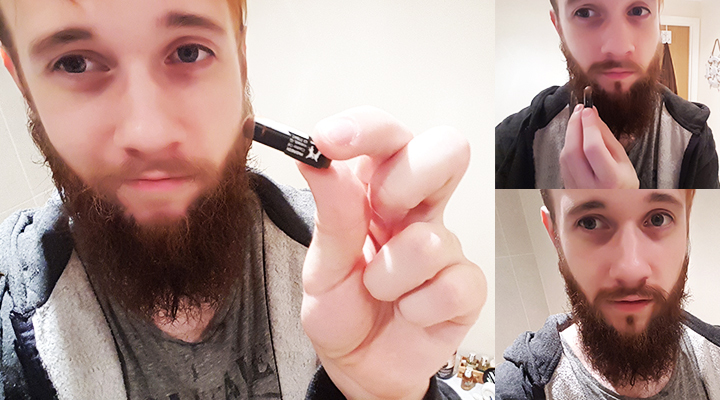 Just draw it thinly around your beard after applying the pencil, let it settle a bit, then gently rub it in to your skin away from your beard. PS. We’re aware most of your bearded guys don’t buy make up (maybe some of you do, that’s cool!). Lush is a completely judgement free zone, just in case you were worried. It’s also 2016, and times are changing. You do you. This and any of Lush’s other shampoo bars are great for beards! They’re a little less fiddly than a liquid shampoo, you just get your beard wet and rub them on. Try to avoid rubbing it directly on your lips, though most Lush products are great for sensitive skin the nettle and peppermint infusion might be a tad too much for that area. Just aim for the chin. This one’s great for adding shine and stimulating your hair follicles, so expect your beard to start looking much happier and healthier. Needless to say, this is great on your hair too! Sorry I couldn’t get you a picture for all of those, but Lush has plenty of great models on their website to show off for you! Anyways, once you’re done pampering your beard, get out there and share it with the world! There are LOADS of products on offer in Lush, all ethically sourced (and the vast majority are vegan) and natural. So you can rest assured your beard, and face (and the rest of you, if you get side tracked by other products) are in good hands. 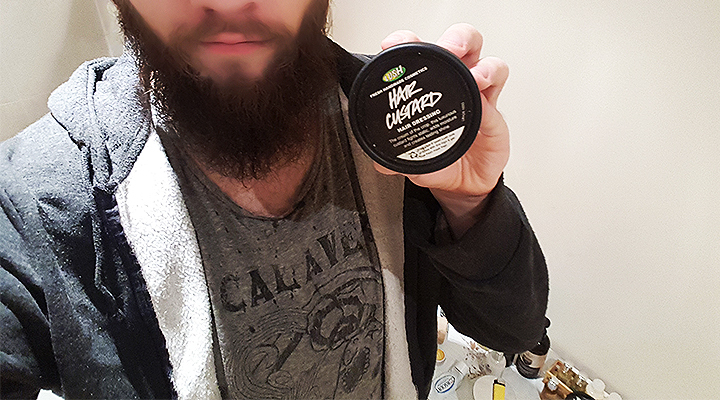 Chances are if you’ve seen a product for use with hair in Lush, it’ll work just as well in your beard. But always ask the staff, just in case. 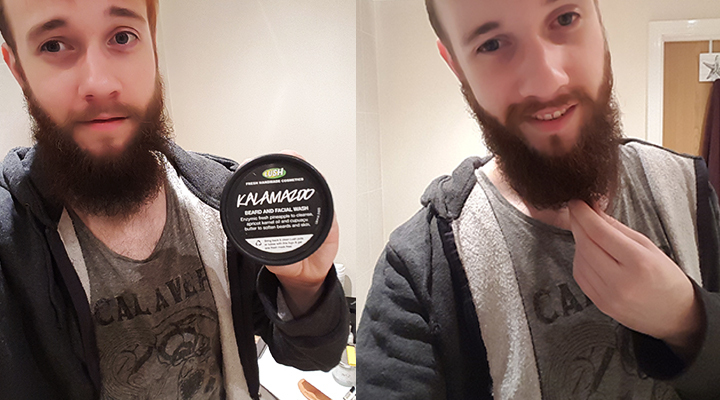 Also, if you’ve found a Lush product for beard use let us know – you could be featured in our blog! You can ask for a test pot of just about any product in Lush. So why not ask and experiment with what works for your beard? You too, could have a proper Lush beard!